Marie Barnes Jones, 88, of Wake Forest, formerly of Wilson, died peacefully at Laurels of Chatham in Pittsboro, NC on August 25, 2017. The funeral service will be conducted Tuesday, August 29, 2017, at 4 p.m., at Saint Mark’s Episcopal Church, 106 Reid St. SE, Wilson, NC. Fr. Philip Byrum will officiate. The family will receive friends from 3 – 4 p.m. Tuesday, one hour prior to the service, at Saint Mark’s Episcopal Church. Marie Barnes Jones was born in Wilson County on June 6, 1929 as the first of five daughters to Clarence and Lossie Barnes. She was a loving, caring and nurturing woman who had a great love and compassion for others. Marie graduated in the class of 1949 from Frederick Douglass High School in Elm City, NC. 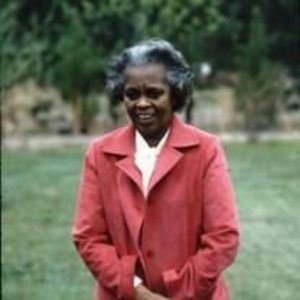 She later attended St. Paul’s Technical Institute in Lawrenceville, Virginia, where she became a member of both Delta Sigma Theta Sorority and the Episcopal Church. She started her career as a dental assistant at the Eastern North Carolina Sanatorium in Wilson, but later followed in the footsteps of her mother by beginning her career as a seamstress. During her career, Marie worked her way up to become head of the alterations department at Belk in Wilson and eventually retired. In her retirement, she followed her true love which was children. You could often find her babysitting for working families and making children’s Halloween costumes. She was dedicated to volunteering for her community. Her volunteer time was spent serving those in need at St. Timothy’s Episcopal Church Soup Kitchen, deadheading roses at the Wilson Rose Garden and mentoring for the Wilson County Foster Care program. A true passion of Marie’s was going door to door getting her community out to vote and working the polls during elections. Once her grandchildren, Christopher and Tiffany Simons, were born, she dedicated her life to taking care of them and her daughter, Edwina, in their home in Wake Forest, NC. Marie was a loyal supporter of Saint Mark’s Episcopal Church and the Frederick Douglass High School Alumni Association’s scholarship program. Surviving are her daughter, Edwina Jones Simons of Youngsville; two grandchildren, Christopher Simons and Tiffany Simons, both of Youngsville; four sisters, Mollie Grace Barnes Corbin of Claymont, DE, Verona Barnes True of Wilson, Jeraldene Barnes Massey of Oxon Hill, MD and Alice Barnes Freeman and husband, Charles E. Freeman of Wilson County; ten nieces and nephews, Raynite, Phillip, Aaron, Rachel, Winifred, Charles, Stephanie, Alicia, Noel and Lossie; five cousins, Christine Barnes Richie, Catherine Barnes Slade, Ruby Barnes Spoons, Romaine Barnes Harris and Mavis Barnes Harris; and many extended family members and friends. Marie was preceded in death by her parents, Clarence and Lossie Baker Barnes. In lieu of flowers, memorials may be directed to Saint Mark’s Episcopal Church After-School Program, P.O. Box 4405, Wilson, NC 27893.